About | Bhagavad Gita means the Song of God or The Song Celestial. Krishna, as the speaker of the Bhagavad Gita, is referred to within as Bhagavan (the divine one). 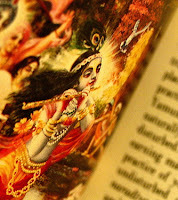 The Bhagavad Gita is revered as sacred by Hindu traditions. The content of the text is a conversation between Krishna and Arjuna. During the discourse, Krishna reveals his identity as the Supreme Being Himself (Bhagavan), blessing Arjuna with an awe-inspiring glimpse of His divine universal form. For a comparative religion's perspective, Krishna is the manifestation of God and the conversation of Gita can be compared with Hadith Qudsi or sacred sayings of Prophet in Islamic tradition where God speaks through the Prophet himself. Although Hadith Qurdis are recorded as God speaking directly, interestingly they are not part of Quran or Direct Divine Revelation. It gives a hint how the nature of Divine Revelation can take on multiple forms, not just a single static format.
. 40 Hadith Qudsi with audio.